For years, a slew of advocates – many of whom have been paid for their services — have flooded U.S. airwaves on behalf of the Mujahedeen e-Khalq (MEK), a State Department-designated foreign terrorist organization opposed to the Iranian regime. After months of difficult negotiations, the MEK has finally begun moving out of its secretive Iraqi home near the Iranian border, called Camp Ashraf. But the group’s American advocates have now become a major obstacle in the international effort to move the MEK to a new home in Iraq and avoid a bloody clash with the Iraqi military, officials say. U.N. special representative in Iraq Martin Kobler, with help from the U.S. Embassy in Iraq and the State Department, has organized efforts to relocate the MEK to Camp Liberty, a former U.S. military base near the Baghdad airport. The first convoy of about 400 MEK members arrived there last month. The second convoy of about 400 MEK members arrived Thursday at Camp Liberty, Reuters reported. 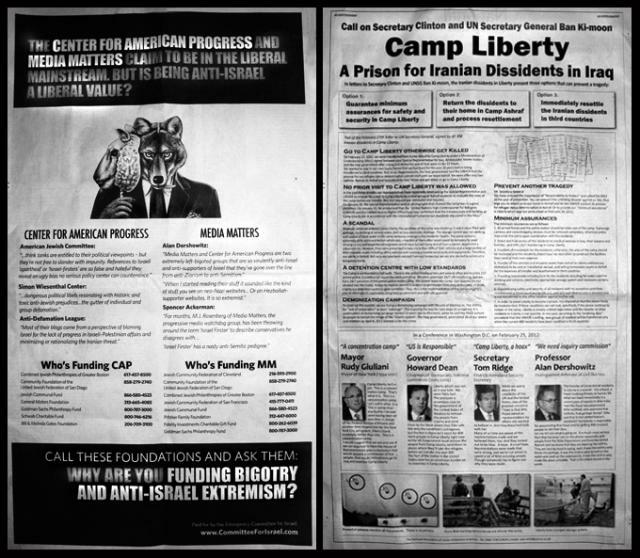 "Camp Liberty: A Prison For Iranian Dissidents in Iraq," reads a March 3 full-page ad in the New York Times, leveling the surprising accusation that the former U.S. military base is unfit for human occupation. The ad quotes former New York Mayor Rudy Giuliani calling Camp Liberty "a concentration camp" — a charge Giuliani made at an MEK-sponsored conference late last month in Paris. The ad also quotes former Democratic National Committee chairman and Vermont Governor Howard Dean, former Homeland Security secretary and Pennsylvania Governor Tom Ridge, and Harvard Law Professor Alan Dershowitz trashing Camp Liberty. The administration official told The Cable that, as delicate negotiations between the U.N., the United States, the Iraqis, and the MEK continue, the role of these often paid advocates is becoming even more unhelpful and potentially dangerous. "The Americans who ought to know better and claim to be on the side of good solutions are really damaging it. Either they are too lazy or too arrogant to actually do their homework. They don’t spend the time to learn facts, they just pop off. They accept the MEK line without question and then they posture," the official said. "We have a plan that has a chance to work and the Iraqis want it to work. The MEK … it’s not clear. And in this situation they are being badly advised by the people whose names appear in these ads." "Whether the MEK wants a resolution or wants a confrontation is something we’re still debating. It’s that bad," the official said. The relationship between the American advocates and the MEK leadership, led by the Paris-based Maryam Rajavi, has led both to pursue strategies that neglect the dire risks of sabotaging the move from Camp Liberty to Camp Ashraf, the official said. Rajavi is said to have created a cult of personality around herself and to rule the MEK as a unchallenged monarch. "The not-too-stable Queen [Rajavi] hired a bunch of court flatterers to tell her that she’s great, which is fine, except that she has now forgotten that these are hired court flatterers. She thinks they are actual advisors," the official said. "Meanwhile her wise counselors are being marginalized by those who are saying ‘Oh Queen, your magnificence will cause your enemies to fall on their knees.’ And she’s beginning to believe them." "By enabling Rajavi to indulge her worst instincts and encouraging her to think she has more power and leverage she does, they may precipitate a crisis, which is exactly what we are trying to avoid," the official said. Another example of the American advisors’ unhelpfulness was the MEK’s recent public call to be relocated en masse to Jordan, an idea the U.S. official said came from the group’s American friends. There was just one problem: Nobody had asked the Jordanians. "To announce it publicly as a demand without checking with the Jordanians is the sort of thing you do to destroy it," the official said. "Why the hell should the Jordanians buy trouble like this by giving these people an autonomous militarized camp?" U.N. and U.S. officials had been hoping to keep discussions open with Jordan about the possibility of hosting some MEK members in the event of an emergency, such as a renewed outbreak of violence. But U.S. officials now think that the MEK’s actions have made that much more difficult. "Whoever advised them has done actual demonstrable damage to a possible humanitarian solution. They’re not helping. It’s remarkable," the official said. The arrival at Camp Liberty Thursday of the second convoy may signal that the MEK is coming around to the realization that the Iraqi government will never allow it to stay at Camp Ashraf. But the U.S. official warned that the group may have more tricks up its sleeve. "The MEK will delay, confuse, deny, and spin until faced with an imminent disaster, and then they give only enough to avoid that disaster," the official said. "And the problem is: If you play chicken enough, eventually you will get into a head-on collision."